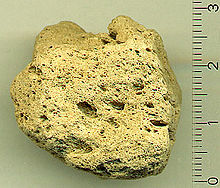 University of Oxford image of pumice. Retrieved 2010-09-27. Analytical identification of a single source pumice from Greek shores and ancient sites in the Levant. On the occurrence of a pumice-rich layer in Holocene deposits of western Peloponnesus, Ionian Sea, Greece. A geomorphological and geochemical approach.